DIY earring designs – bead soup! Or, well, Part Next because I can’t remember if I did Part Two or Three already. But these are definitely “do it yourself” earring designs. This was another little instanteous assignment I gave myself – “okay, create a few earring designs using just what’s sitting here on the desk in front of you right now”. Once again, i didn’t try to “match” colors. I just played with simple combinations of stones (and one ornament, the silver-ish flower) I had sitting on my work table. 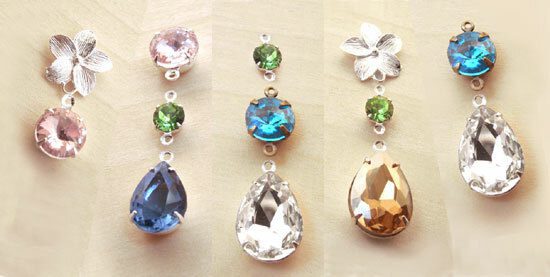 These would all be simple to make, using jump rings or wire wrapping with other small beads. Okay, they’re not Tiffany’s, but they’re doable and fun and would look gorgeous on you. And they don’t cost much. And you can do it. And until you hit the lottery, doesn’t that work for you? P.S. Oops! Yes, these components are all available in my Etsy shop. Okay, this is one of the reasons I love Etsy. Well, besides the fact that I sell stuff there. Because I can find original, practical, affordable, and way cool gifts like this one. This used to be a guy’s shirt. Now it’s an apron. 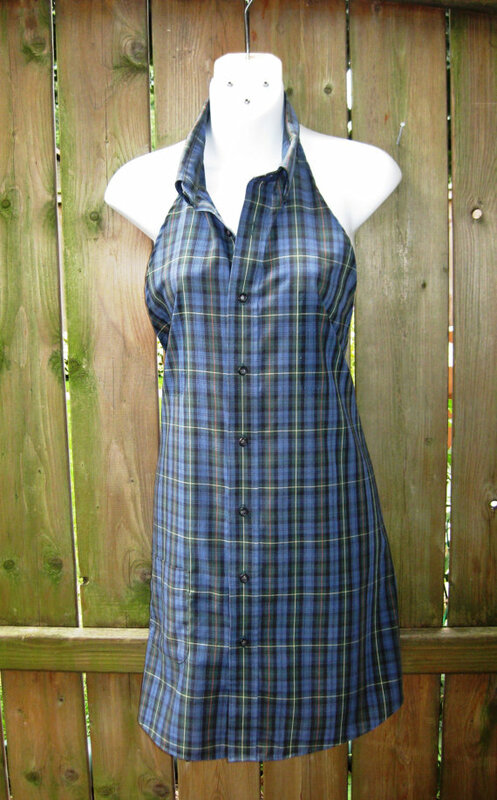 This has so much going for it: the dark blue plaid means it’s not going to show every stain it gets. It’s washable. It’s practical if you cook. Wouldn’t you rather wear this refashioned, fun, useful apron while you’re cooking, and not get olive oil on your best jeans or dress-you-wore-to-work? And, major plus, it’s CUTE. And it’s refashioned: a double-bonus major plus. Judy, the owner of the wonderful Sew It Was shop on Etsy, has made it the focus of her shop: she takes old garments and gives them new life. New FUN life. New useful life. Also, if I might point out, super affordable life. These are all pluses I wanted to mention. But most of all, I like this garment – and I could use it – and I bet you know a couple other people who would love it! 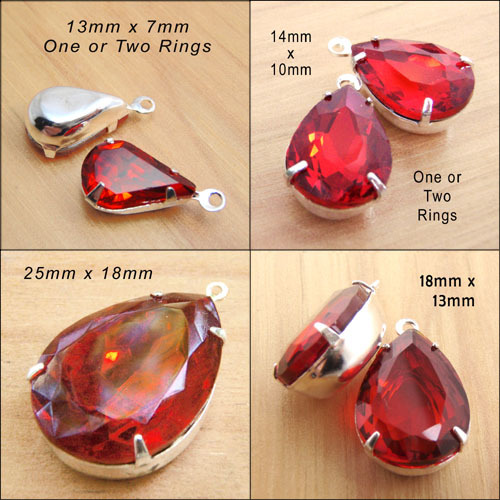 I think these are just darling – earring jewels set into closed, flat-back settings, so you can make your own button or stud earrings. Add a little sparkle to your everyday outfit! These are not Extreme, or dangling, or any of that – they’re just fun and pretty and you can wear them anytime or anywhere. These are “rivoli” jewels, which have a faceted point (rather than “flat table”, as in “table tin cut”) on the face of the jewel. They have a wonderful sparkle, and they’re available in vintage patina brass or light golden (raw) brass settings. Use a secure jewelry glue to add an earring post or clip-on to the back, and you have quick and easy and gorgeous earrings. Lots of colors, too – I show them here in soft rose pink, crystal, peridot green, and light colorado topaz (golden tan) – but I’ll have lots more choices in my Etsy shop– I just took this pic first. Gifties for your buds, or for yourself – look great, and spend less. This is a good plan! 1950s Vintage Bombshell Dress Wow! I’ve found a new favorite vintage shop on Etsy – just look at this fabulous dress! And it’s great to see model pics, isn’t it? So I know how the dress looks on a real live person. Talk about versatile and classy – like I could wear it to work or for Date Night – without being all fussy and Trying Too Hard. This is what I want – what I NEED – in a dress. It’s available at Wyoming Vintage on Etsy. I think this girl may have tapped an unexpected treasury out West – her shop is full of wonderful finds. Go check it out, you are so totally going to thank me! 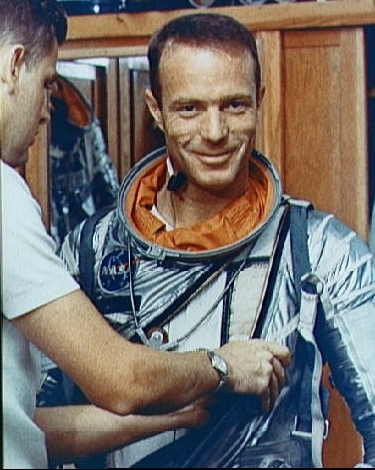 Scott Carpenter died today. If you weren’t a space freak like me you might not remember the name. But a lot of us do. He was one of the Mercury Seven. Good looking, brash, hey he was a test pilot and probably a prima donna. Married four times. I bet he was a handful. Wish I’d known him. He was one of my heroes. Because parties are coming. Christmas, and New Year’s, and office parties, and for that matter, any special occasion you want: ruby and red and crimson and siam are always in style.